RFT Deutschland expands with a new official Team in the VfL Wolfsburg sport club. RFT Luta Livre has now reached the city of Wolfsburg in Germany, becoming the third official Team in this European country. This was announced by RFT Deutschland director Nico Welko. The city Wolfsburg is named after the Weser renaissance castle “Wolfsburg” (eng. Wolf castle) with records back to the year 1302. The city is located in the State of Lower Saxony with 123.000 inhabitants and also known as the “Autostadt” (eng. city of cars) due to the large car manufacture companies in the city. The new RFT Team is located in the VfL Wolfsburg sport club. VfL Wolfsburg is best known for its soccer department with the professional team playing in the "Bundesliga" and now the sport club has an RFT Luta Livre department under the training direction of Mayes Besbes. Coach of RFT Team Wolfsburg Mayes said, "It's a huge honor to be a part of the RFT Team and to work together with a Black Belt of such level like Nico Welko as well. 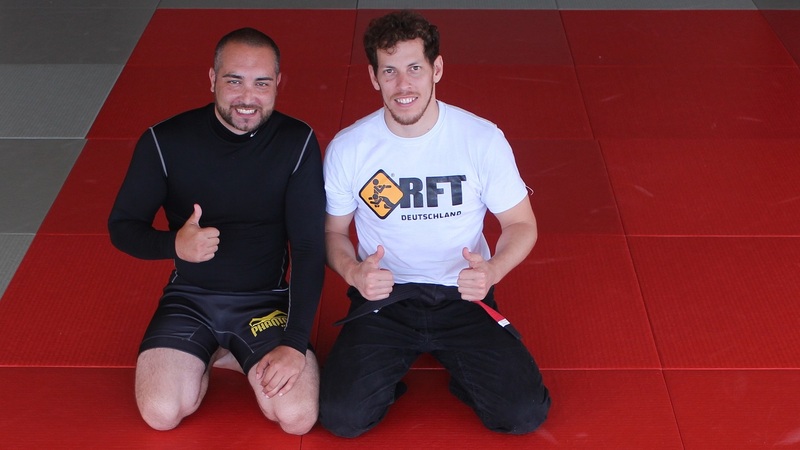 We want to develop our young MMA and Luta Livre Team to a professional level and that is why we are also so happy to came on board to join the programs of RFT Deutschland". Further he added, "I for myself found out that I extremely like the teaching style of Nico Welko. He is not only convincing through his friendly and open manner but also through his teaching competences and these are particularly very important points for our development as a Team". Nico Welko, the RFT Black Belt responsible for the guidance and education of the RFT Teams in Germany and Australia tells, “We are happy to welcome the new RFT Team Wolfsburg in our expansion program now after we have fulfilled all of the requirements to represent RFT Luta Livre [...]. I have no doubt, that Mayes is on the right way to become a competent trainer for his students and athletes as he is attending some of our professional training programs to develop the specific skills needed as a trainer and Luta Livre practitioner”. Marcio Cromado, founder and leader of RFT welcomed the new affiliated Team speaking from Rio de Janeiro, "It will be a pleasure to work with the VfL Wolfsburg sport club and I'm very thankful for them having chosen RFT Luta Livre and the work of our Black Belt Nico Welko [...]. Soon I will be in Germany and will be happy to train and to share with all of you parts of our work from Rio de Janeiro". The RFT Team Wolfsburg is additionally another official supporting base for RFT Deutschland’s activities with over 420 square meters of mats area, a fully equipped Olympic weight lifting gym and a laboratory with sports-medical performance diagnostic facilities.